At the Office of Edward Lord, Esq. ; of Messrs. Kemp and Co. ; of Edward Curr, Esq. ; at the House of P. A. Mulgrave, Esq. and at the Gazette Office, Hobart Town. At the House of T. A, Lascelles, Esq. New Norfolk ; James Gordon, Esq. Pitt Water; and G. W. Gunning, Esq. Coal River. At Port Dalrymple:-Thomas Archer, Esq. J. P.; Mr. Commissary Roberts ; T, C, Simpson, Esq. ; and James Cox, Esq. J. P.
Where the Contributions of all Persons will be thankfully received. It is considered scarcely necessary to state, that the Catholic Community, for whose particular Accommodation and Good this Undertaking is about to be commenced, will be expected to give their Aid in every Shape in which it can be useful, and suitable to their Condition. 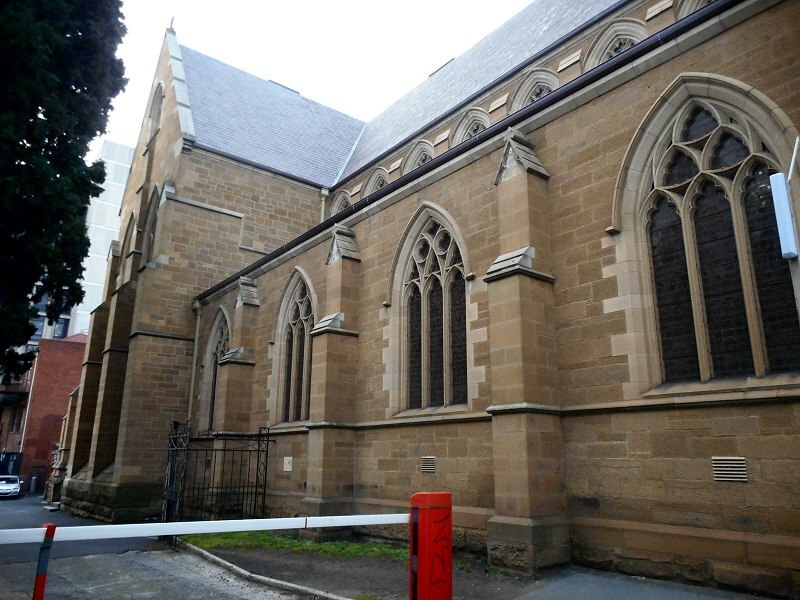 I’m not sure on actual location on the chapel, but it appears to have been close to the corner of Harrington & Brisbane Sts. In 1831, an advertiser gives his location as “situated in Brisbane-street, at the corner of Harrington street, (opposite the Roman Chatholic Chapel). 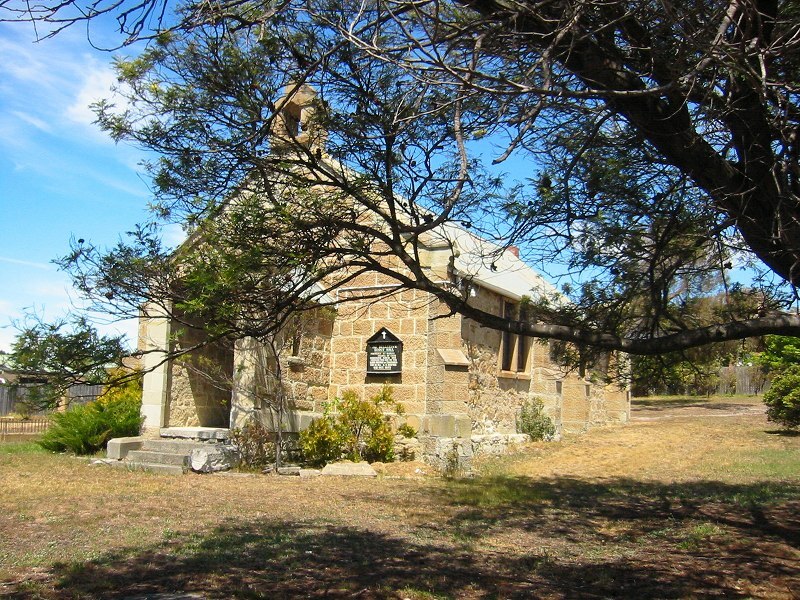 In 1833, a cottage is advertised for sale at the “premises in Brisbane street facing the Catholic Chapel”. 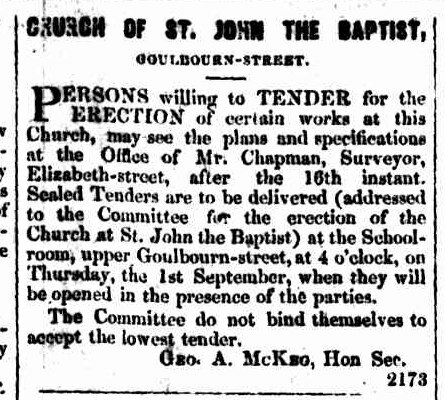 In 1834, another advertiser gives his location as “opposite the Catholic Chapel, Harrington Street”. 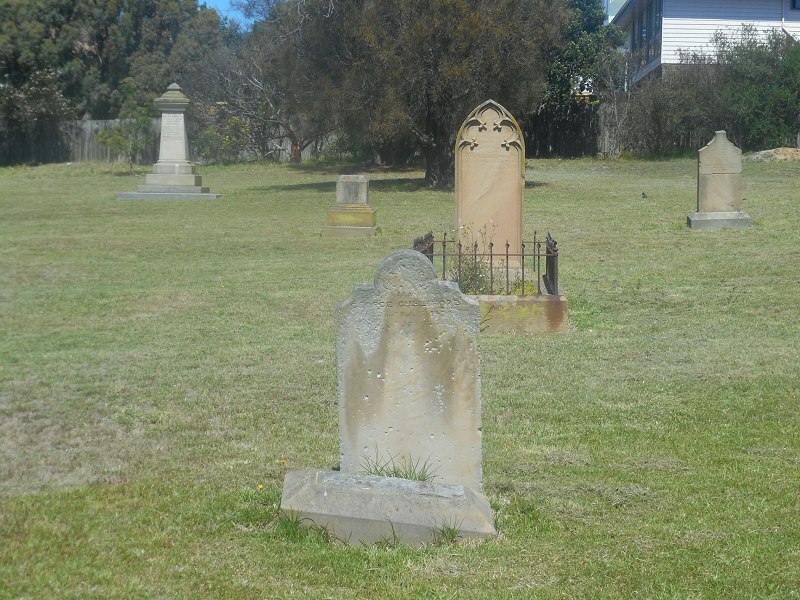 It is not generally known that the body of Colonel Collins, the first Lieutenant Governor of this colony, lies interred in the corner of the churchyard next the town. About a year after his death a small wooden church was erected over the grave, and the altar, such as it was, was built directly over it. 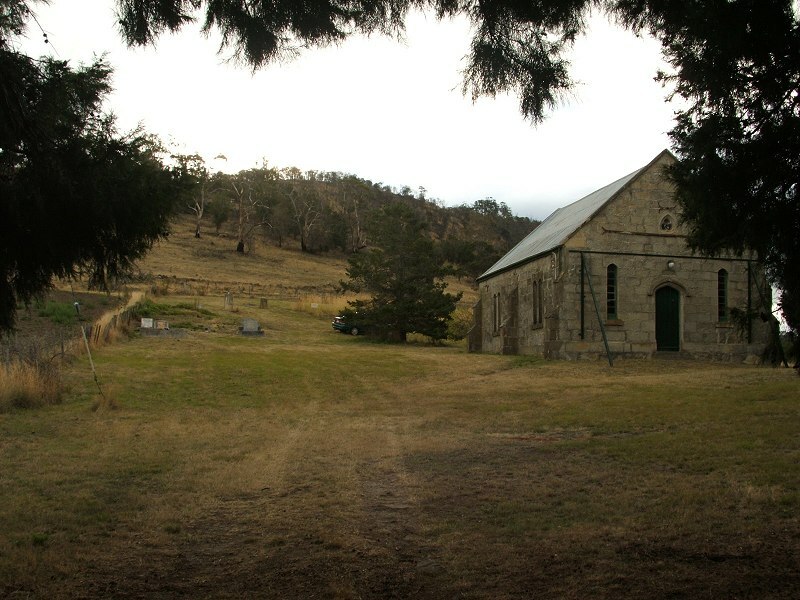 This building however did not remain long, for being got up in a hurry for the reception of Governor Macquarie to attend divine service in during his visit here, the stays were not properly fixed, and in a sudden gale of wind it was blown over. On the St David’s cathedral website, there is an artist’s impression of that building, placed in context (use the slider below the image). whose body resided beneath the altar. Cnr Macquarie & Murray Streets, Hobart. (Murrary St entrance shown above.) Opened 1874, replacing an older building of the same name. Photo 1878, Macquarie St facade. The bell tower has since added at the front left, and the main building extended to the right. Engraving, 1886, from the corner of Murray& Macquarie Sts. 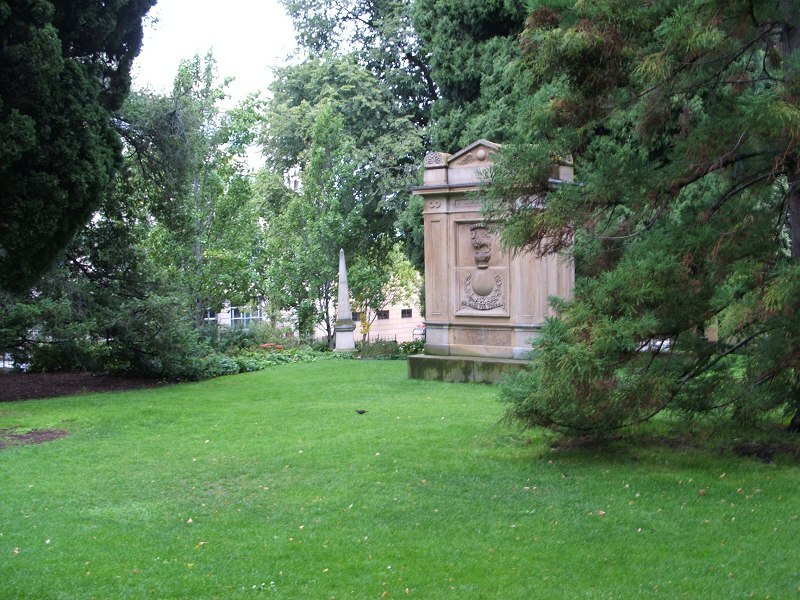 The vacant corner is now occupied by the bell tower. 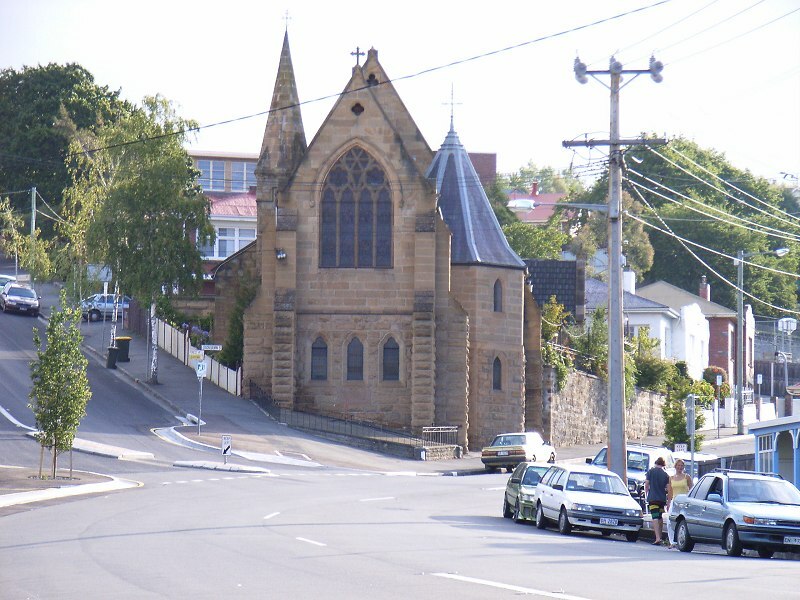 Photo from north with what appears to be the tower of the older church behind. 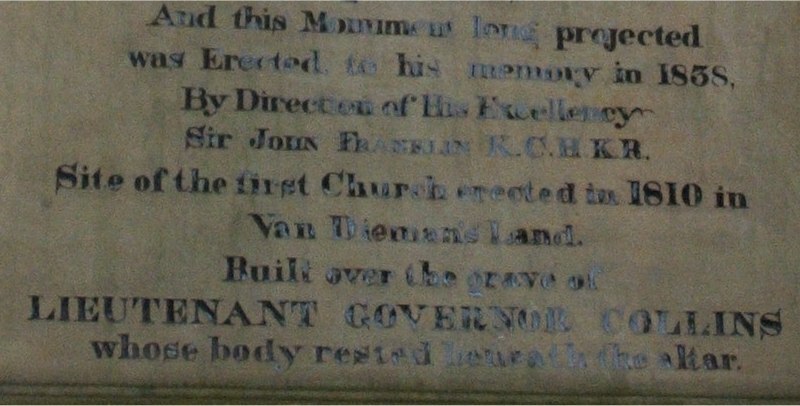 THE Civil and Military Officers are requested to attend at Government House To-morrow Morning at Half-past Eleven o’clock A.M. to accompany the Reverend ROBERT KNOPWOOD to the Ground prepared to lay the Foundation Stone of St. David’s Church. 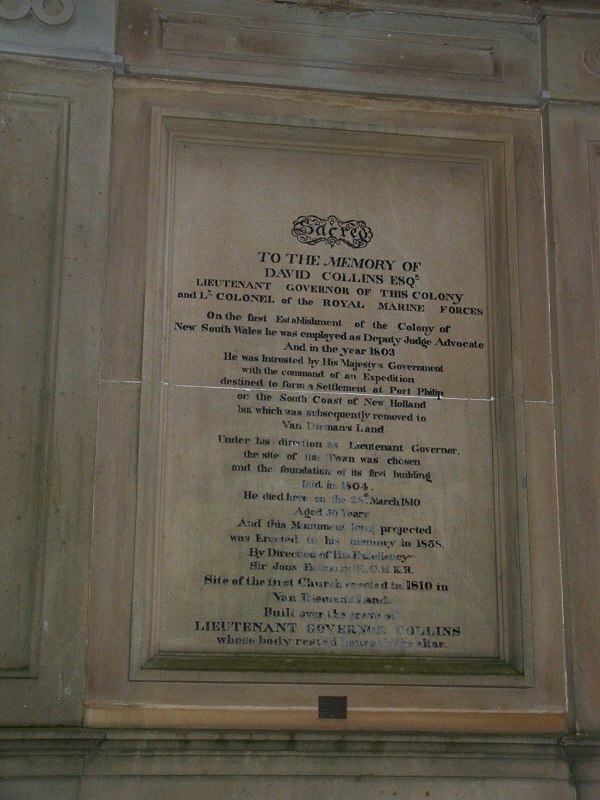 In Consequence of which, the same will be observed as a Holiday throughout the Settlement; and the Acting Assistant Commissary General will cause to be issued to each of the Non-commissioned Officers and Private Soldiers, Superintendents, Overseers, Constables, and other Persons in the actual Employ of Government, Half-a-Pint of Spirits. 67 Brisbane St. 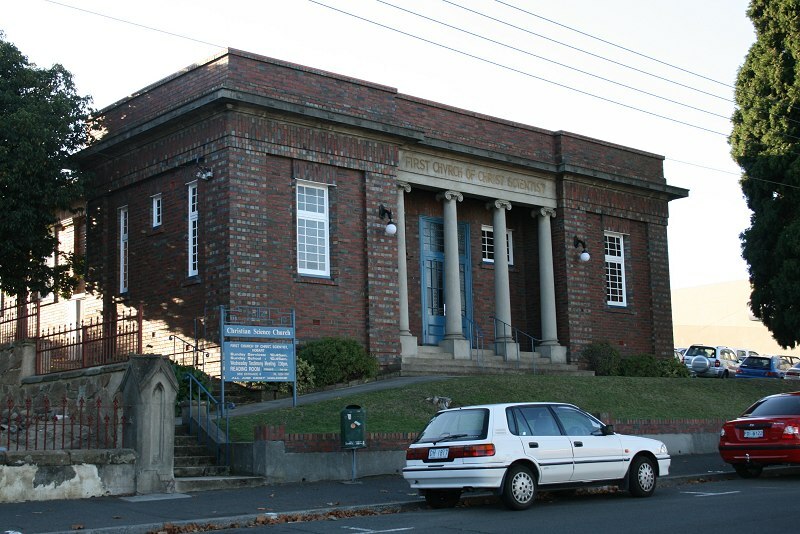 Opened 1929. 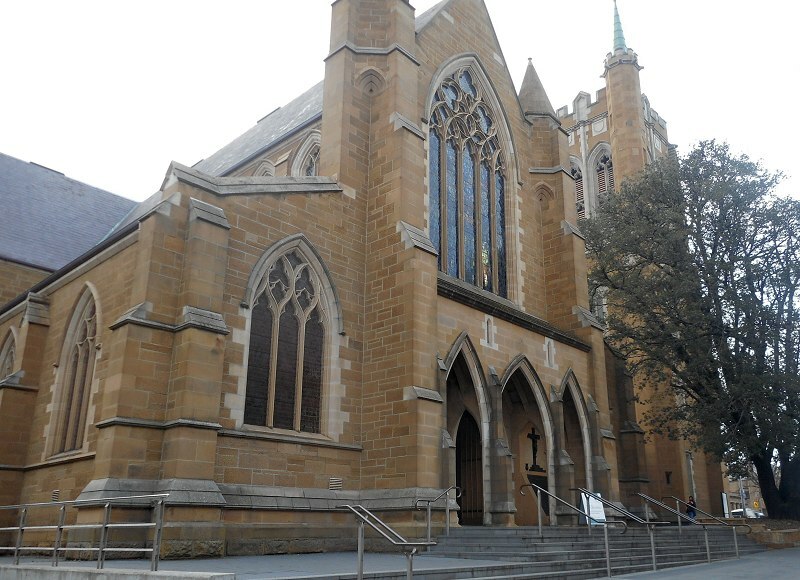 On a recent Sunday in Hobart the Christian Science Church, “First Church of Christ, Scientist, Hobart,” at 69 Brisbane street, near Elizabeth street, was dedicated. Christian Science churches are not dedicated until they are debt-free, and it was with glad hearts and grateful thanks to the Giver of all good that the doors were opened for three services that day. Each service was a replica of the others, but three were necessary to meet the needs of all those desiring to attend. 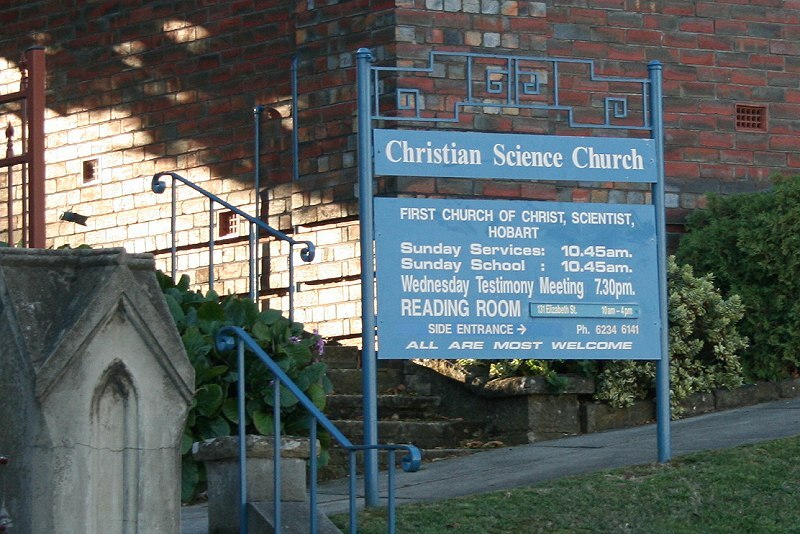 In the dedicatory announcement, which was of extreme simplicity, the following facts and dates were included: The first recorded meeting in Hobart of a group of people interested in Christian Science was held on 26th February, 1913; one year later, 25th February, 1914, the group had so grown that a room had been rented in Miller’s Chambers, Murray street, and regular Sunday services and Wednesday testimony meetings were commenced as from that date; as the group grew in numbers, successive moves were made to 145 Macquarie street; Y.M.C.A. Building, Murray street; and the Bijou Theatre, Melville street; the first de- finite step towards erecting its own edifice for worship was taken in March, 1922, when the group inaugurated a church building fund; official recognition of the establishment of Christian Science in Tasmania came on 30th July, 1923, when the group was received as an official branch of “The Mother Church, The First Church of Christ, Scientist, in Boston, Massachusetts, U.S.A.,” the Hobart organisation being named “Christian Science Society, Hobart”; in July, 1928, the society purchased its fine building site in Brisbane street, and in September of that year was granted full branch church status as “First Church of Christ, Scientist, Hobart”; the foundation stone of the church edifice was laid during December, 1928; the first services in the new building were held on Sunday, 17th March, 1929, Sunday school being held in the edifice on Sunday afternoon; at a meeting in April, 1933, the membership decided to enlarge the edifice. 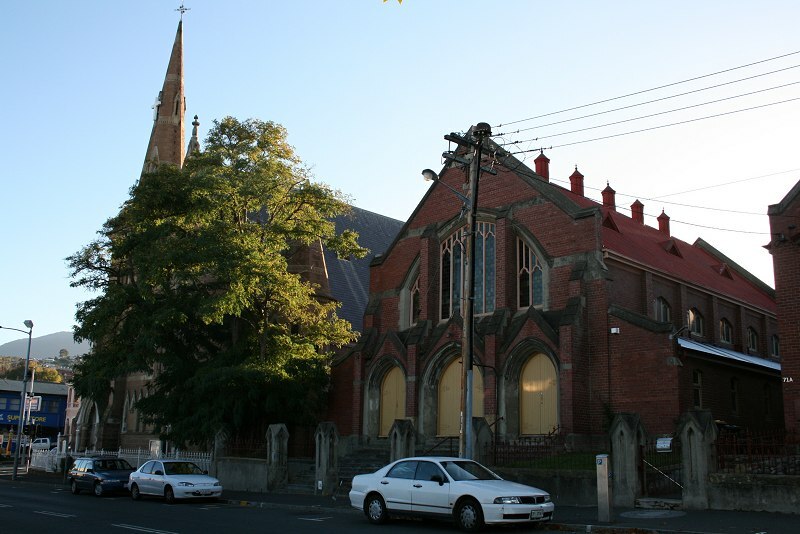 When completed, the addition was partitioned off, sound-proofed, and set apart for use as a Sunday school during the period when the morning service was being conducted in the main edifice. 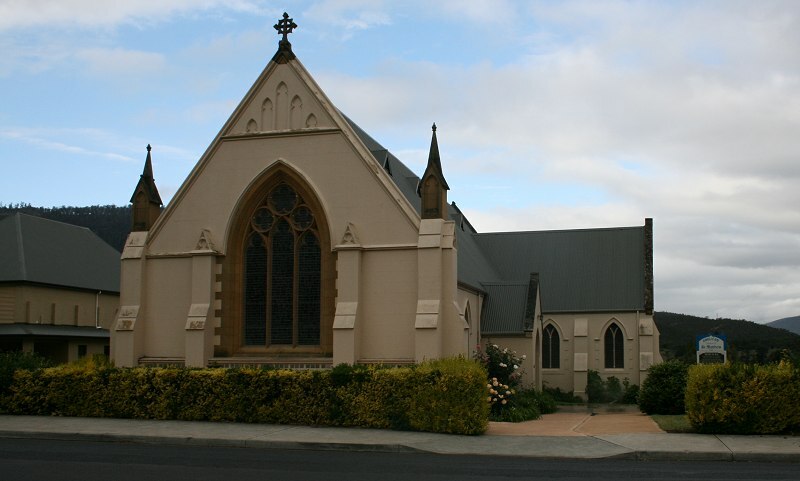 Thus the edifice is already in existence when further extensions are necessary to accommodate increased congregations, all that is necessary to secure larger church premises being to knock out the partition and instal church seating. As will be seen from the illustration, the building is attractively constructed of burnt brick with concrete pillars, and accessories include metal window frames. The building is heated by electricity, and has an inclined floor, which enables everyone in tho congregation to secure a clear view of the readers who conduct the services. 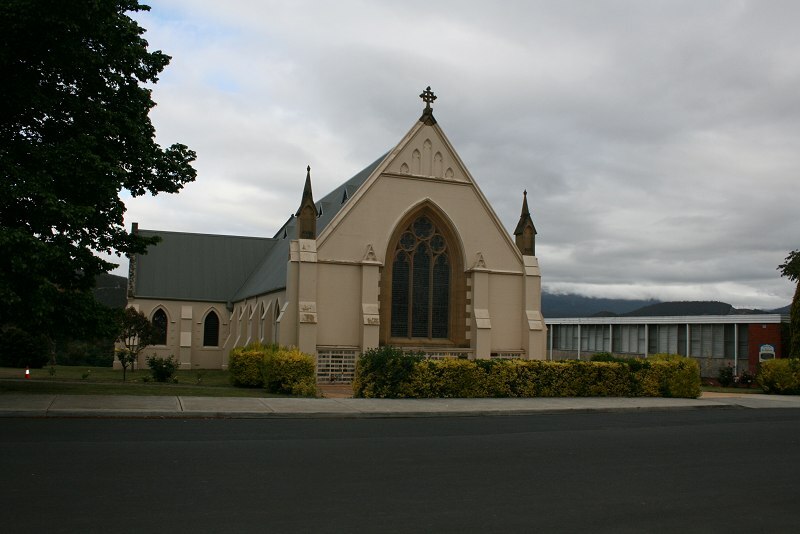 The beautiful church of St. Matthew’s as it now is, its gabled roof, stained glass windows, and noble chancel, is a very different building from what it was when the church was first erected. All that is left of the original building are the walls and flagged floor of the nave, and possibly the western walls of what are now the transepts. And even as to these there is a certain amount of doubt. 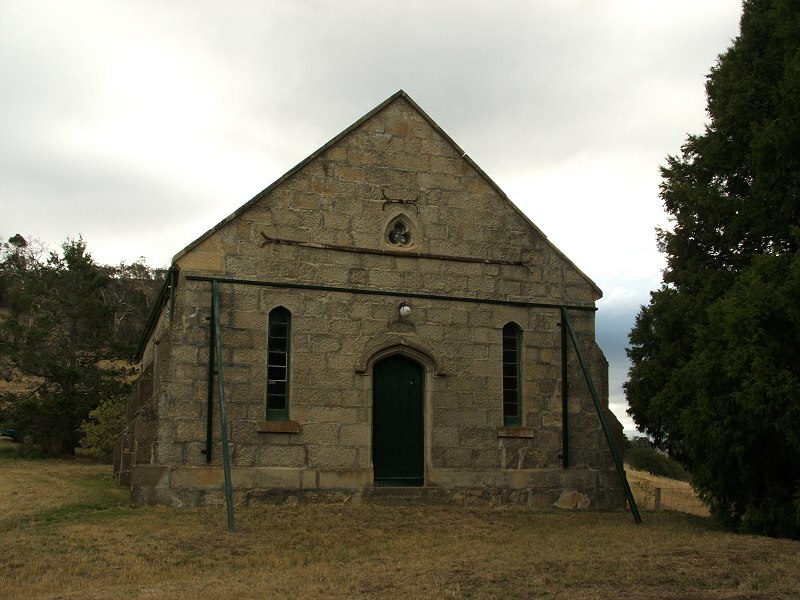 The foundation stone of the chancel has on it the words, “Erected in 1825, Chancel added in 1894.” But there was a schoolhouse which, begun in 1823, was finished in 1824. Whether this was the present nave or part of it is uncertain, though there is little doubt that a portion of the present church was originally built for a school. 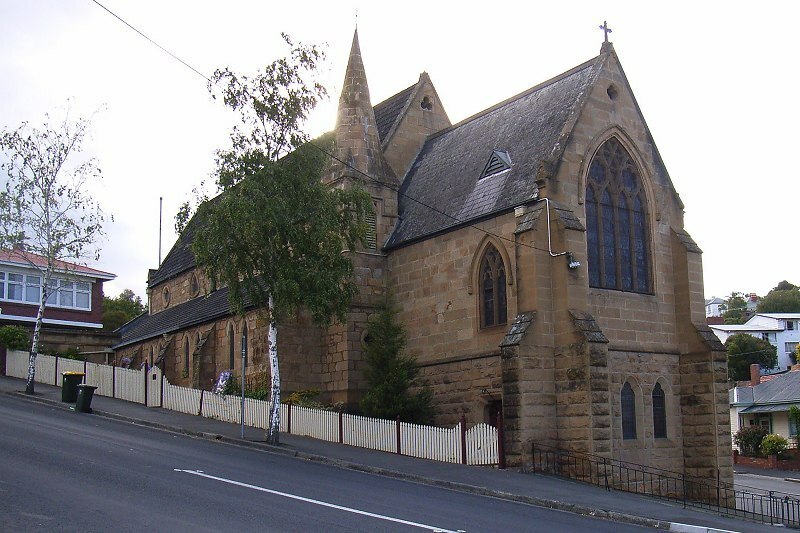 It was not used definitely as a church till Mr. Robinson’s time, for, it was in the month that he arrived there, August, 1825, that tenders were submitted for church furniture, and a pulpit, reading desk and communion table put in the building. The carpentry work in the building was of a poor quality; for on Sunday, December 4, 1825, a portion of the ceiling fell in. Colonel Sorell and other distinguished characters, is rapidly becoming improved. At New Norfolk, the Church is roofed in, and completed. Since that time, the building has been extensively modified and its appearance has dramatically changed. A postcard from the State Library of Victoria with an illustration c.1825 and an engraving from LINC Tasmania, published in 1834 both show a church building very different to that in the above photo. This, from the early 20th century, has a more familiar form.